skills to use as a leader in student organizations. As a C.L.A.S.S. Advocate (CA), I have gained many leadership qualities and skills necessary for post-graduation opportunities in addition to gained experience from the executive positions I currently hold on campus. If it weren’t for the five programs I have to implement every semester as a CA, I would not be able to help prepare, promote and execute program ideas for other campus organizations in which I am involved. 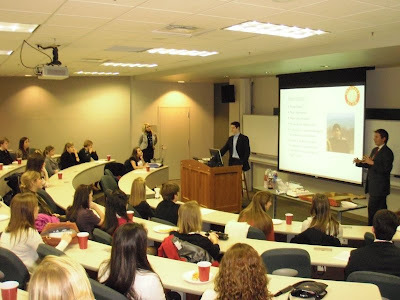 Likewise, the many occasions during which I stood in a room of multiple girls—sometimes nearly 100—to host a program and to command the attention of that audience, I would not be able to effortlessly stand in front of my lecture classes to make a presentation or make announcements during club meetings. This motto is what I learned working in Brumby Hall and it is also the motto of Rotaract, a professional leadership and community service organization of which I am currently the vice-president. The University of Georgia is our home for the next four years. University Housing provides us with a space on campus that we can call home. In essence, Athens is also our community and we have a responsibility to take care of what is ours through personal efforts like service. One of the easiest ways students can do this is by reaching out to and getting involved in on-campus organization such as the UGA Rotaract Club, an organization that maintains a strong service presence in the Athens community. Applications are due tonight by midnight. For more information, please visit the UGA Rotaract Club's website. If you would like to know more about the C.L.A.S.S. Advocate program, please visit the Work for Housing section on our website. Elizabeth Rene is a senior majoring in public relations and international affairs. She is the current UGA Rotaract Vice President and a C.L.A.S.S. Advocate in Brumby Hall.